Wedding dress alterations such as bustle additions can be fairly expensive, and the last thing a bride needs when trying to stick to a wedding budget. An attractive wedding dress bustle is not as difficult to make as it may seem, and costs much less to make on your own. Whether you have made your own wedding dress or are altering an existing dress, a bustle will help get your train out of the way so you can better celebrate when the ceremony ends. Determine the style of bustle that is best for your dress (see Resources for style options). Since some bustle styles may be too complex for a beginner, start with the "overbustle" style, which is the easiest and most common type of bustle used on wedding dresses. 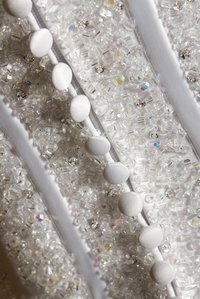 Decide whether you will use buttons or hooks to attach your bustle. Covered buttons are more secure but do not complement every wedding dress. On the back of your dress, determine where you will place the buttons or hooks. Find the center back of the dress first. Place either one or two buttons or hooks on each side of the center back, spaced evenly apart. Mark these places with pins. Put the dress on your body or on a dress form that is the same height as you. Get a friend to help you lift the back of the wedding dress skirt so the hem falls where you want it to. Make sure you are lifting from the middle of the skirt. Pin the middle of the skirt to the button markings. Put the dress on a dress form if you have not already. Detach the middle of the skirt from the bodice, leaving the pins in the skirt to mark the placement. Refine the pin placement by making sure that all pins are level, then find the center back of the skirt. At the pin level, on either side of the center back, place as many pins as you are using buttons. These are called "bustle points." Remove the rest of the pins. Pin the bustle points to the button or hook placement markings, then step back and see whether the draping looks correct to you. If not, unpin the skirt and readjust the bustle points until you are satisfied. Sew the covered buttons or hooks to the button markings, then sew loops of matching ribbon to each bustle point. If necessary, hand-stitch the loops to the skirt so the stitching is less noticeable. Take each loop and attach it to its corresponding button or hook. Remove the wedding dress from the dress form and put it on your body to test the drape and fall of the skirt one last time. For an overbustle style, you can have two buttons and two bustle points, four buttons and four bustle points, or even two buttons and four bustle points. In this last style, attach two bustle points to each button. If dealing with a designer or particularly expensive dress, inexperienced seamstresses should leave alterations to professionals.